One evening almost two weeks ago, I decided to go downstairs to work on my recent woodworking project. This was after 20 minutes of going back and forth in my head on whether or not I should – it was late, after all, and I was a little tired. Accidents happen when people are tired. So at 10:20pm I finally got up off of the couch and went to work. Things were going well, I was making quite a bit of progress. 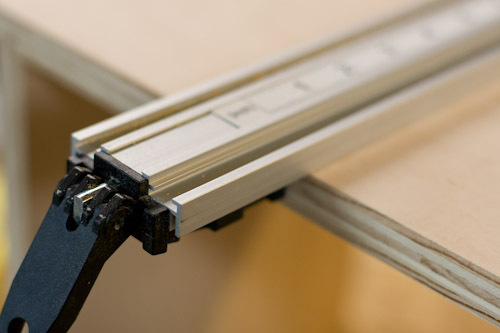 This is the first project I’ve done where I’m using dado joinery and I was getting used to a new tool – a Precision Router Dado Jig riding on a new Straight Edge clamp (seen below). After one of the first cuts, I thought it would be good to test the fit. I slid the other piece of wood into the groove; it was a little tight. So I pushed. Then a little harder. Then at around 11:45pm, that piece of wood gave way. And my wrist took a quite dive right INTO the straight edge clamp. Right there, into that nice sharp groove. A split second later I was staring into my wrist, right at a tendon, through the 2″ slice it gave me – parallel with my wrist starting at the base of my palm. It still gives me the chills thinking about it. Luckily Ana hadn’t gone to sleep yet, so we called my parents (thank you!) to come over to be at the house with David and immediately rushed to the hospital. Ana drove as if she has a secret hobby of watching NASCAR – it was pretty impressive, even flying past a cop through a red light on the way. Luckily the bleeding had mostly stopped about halfway to the ER, and St. Johns was remarkably quick at getting me taken care of. The doctor checked it out and told me that I had just narrowly missed my tendon and that it should heal up nicely. 10-12 stitches and an hour later, I was back at home and heading to bed. The next day, David noticed some of the dried blood on my leather apron as he was walking by a chair it was draped over. “Did you make a mess, Daddy?” Yes, Yes I did. Last weekend I went back downstairs to resume work on the project and you’d think that straight edge had a force field around it the way I was maneuvering. I’m always very careful when I have the power tools out, go figure that it would end up being a ruler that got me. I’ve now added “Anything sharp nearby?” to my mental checklist before starting any new cuts. Two days go I got the stitches removed and am going mostly without bandages, save for the trips to the gym where I want a little protection. It’s still a little ugly but hopefully the scar won’t be too bad. I told Ana that she’ll never be able to get rid of this table, because I’ve put my blood into it! She responded, jokingly, that it still wasn’t finished yet.